Los Angeles all female band Glam Skanks are currently in the studio to record their upcoming album, having opened for Adam Ant and played with The Adicts. 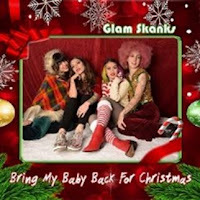 Now Glam Skanks have announced a festive song! It's called 'Bring My Baby Back for X Mas', and if you're looking for rock-n-roll Christmas songs it might be just what the Doctor ordered! You can hear a first play of the song on our Christmas show tomorrow following the Chart replay!